But we can travel further, details on request. which can be covered in either a black or cream leather tonneau cover. used on the Royal wedding car of William and Kate. Bernice, will be your Female Chauffeur for the day, her extensive experience within the chauffeuring & Wedding business, with roots in a family business dating back to 1988. 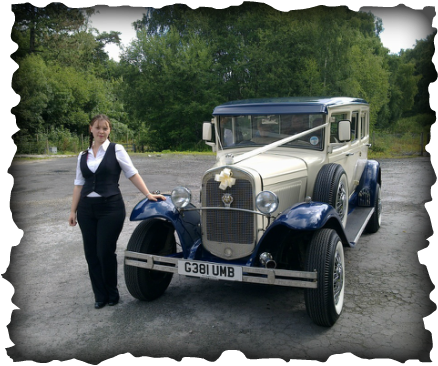 Bernice, an experienced Wedding Chauffeur, With " Clyde " from Belle's and Beaus. Belle is an automatic which gives an ultra smooth ride to your choosen venue. the Father and the Beautiful Bride herself. 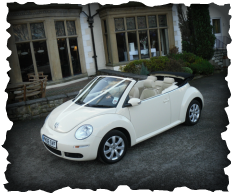 they love it, give's that extra special touch to any wedding day. 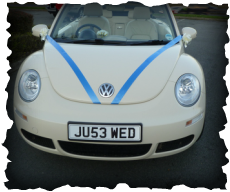 Belle will be fitted with ribbons & bows, which can be personalised to your chosen colour scheme, or left with our standard colour of Champagne .